Tough new plastic wrap netting comes in various lengths and widths to fit many modern hay balers. Vermeer Corporation expanded its forage product line recently with the new Vermeer Net and Rebel net wrapping material for 4' and 5' balers and Vermeer's Rebel Series balers. 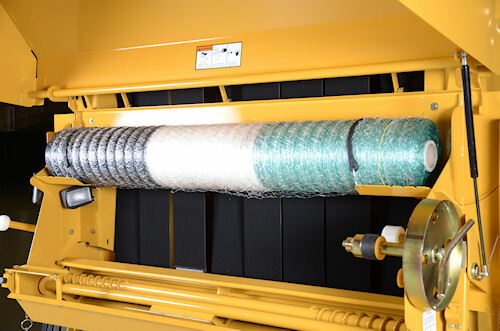 The Vermeer brand netwrap comes in a unique green, black and white color scheme and is available in a variety of lengths to fit numerous popular balers in hay meadows across the nation. The wrap is made from a high density polyethylene plastic for stouter performance than standard netwrap, and it features optimum net spread to cover square shouldered bales with little stretch. For more information on Vermeer's new netting, visit www.vermeer.com. New netting from Vermeer comes in 4' and 5' widths, and Rebel net, designed for Vermeer Rebel Series balers. The new material designed for extra toughness and comes in a unique color scheme.